"The Boy Who Changed The World" is a follow-up review to "The Butterfly Effect." Both books are authored by Andy Andrews. The former is a children's book version of the latter. I am no children's book expert but I do know beautiful artwork when I see one. Credit goes to Philip Hurst's magical hands and extraordinary vision. The illustrations are breathtaking and just looking at them made me decide that I will use this book for my coffee table. 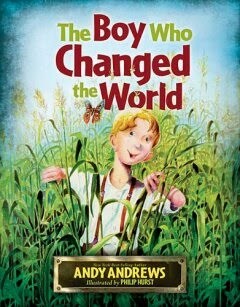 If you are a parent, I highly recommend that you grab a copy of "The Butterfly Effect" and get "The Boy Who Changed the World" for your child. Allow these books to remind your family of the profound truth that every little thing you do matters. The acceptance of God's decision to create you for a reason is important as you would want this lesson to be taught to your child. One of the most powerful gifts a parent can give to a child is to let them know that they have the power to change the world and transform other people's lives. I challenge everyone to get a hold of this book and spend time with a child close to your heart. You will tear up as you read Andy Andrews' beautiful words.